A causeway bends to the right, connecting the mainland to 941-acre Sears Island in Searsport on Penobscot Bay. Mack Point with its oil and gasoline tank farm is visible to the right, and U.S. Route 1 is visible at the bottom of the photo, taken in 2004. SEARSPORT, Maine — The news was spreading like wildfire early this week on the Facebook pages of groups and people who oppose a massive liquid propane gas project proposed for the Mack Point industrial port in Searsport. The rumor was that when Mainers heading to the polls in two weeks vote for or against Question 4, the $51.5 million bond request, they’ll really be voting for or against the Searsport facility. “State and federal regulators are casting a blind eye to the destructive power of the Searsport Megatank proposal. Question 4 lets voters subsidize their own annihilation. If you prefer survival, vote NO on question 4,” stated the Facebook page of “Flower Power,” a coalition of midcoast residents against the propane project. But the rumor is wrong, according to a Department of Transportation spokesman and the head of the Maine Port Authority. “They’re very separate — no connection whatsoever,” Ted Talbot of the Maine DOT said Tuesday. If voters approve the bond request, it will mean that about $41 million will be used for planned road and bridge work in the state. But a smaller amount will be used for infrastructure projects at the ports at Searsport and Eastport, including $3 million for dredging the channel just off Mack Point, which would make the state eligible for $10 million in federal funds. 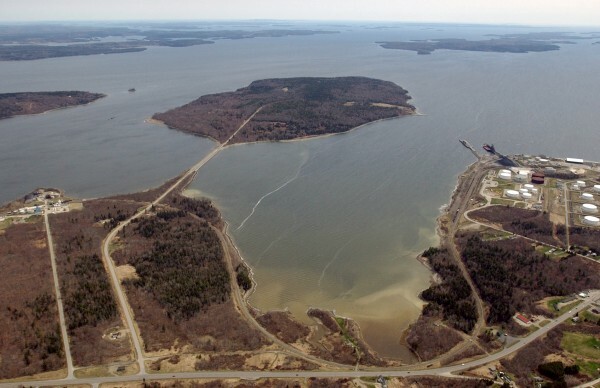 Earlier this month, David Gelinas, president of the Penobscot Bay & River Pilots Association, said that when the federal channel just off Mack Point was dredged in the early 1960s, a depth of 35 feet at mean low tide was established. Since then, there has been no maintenance dredging to keep it at that depth and the channel has become more shallow and narrow in the meantime. The bond issue would allow the channel to be dredged to a depth of 40 feet at mean low water. A 2004 U.S. Army Corps of Engineers study supported the need to dredge the federal channel, Gelinas said. But he did acknowledge that having a deeper draft in the channel is beneficial to all ships visiting the terminal, including any which would bring liquid propane gas to Searsport. “If there’s not dredging, it has a potential detrimental effect to shipping generally in Searsport,” Henshaw said. The bond also would contain $2 million to be used for materials handling equipment for loading and unloading bulk-type goods such as wood pellets and salt, according to the port authority head. The equipment would include a crane attachment and conveyer belts. “You’d have a hard time keeping liquid propane on a conveyer belt,” Henshaw said. Efforts by telephone, email and Facebook Tuesday afternoon to speak with someone from the Flower Power coalition or the opposition group Thanks But No Tank about the purported connection between Question 4 and the propane tank project were unsuccessful. BDN writer Tom Groening contributed to this report.